In chapter 3 the authors distinguish between two zones of free expression in college and university settings: (1) a professional zone, which “protects the expression of ideas but imposes an obligation of responsible discourse and responsible conduct in formal educational and scholarly settings”, and (2) a larger free speech zone, which “exists outside scholarly and administrative settings and where the only restrictions are those of society at large”. On this understanding, members of the campus community may say things in the free speech zone that they wouldn’t be allowed to say in the core educational and research environment. In their view, colleges and universities should never punish faculty members or students who express controversial or offensive views outside the professional educational context, where there are no enforceable scholarly standards, and no disruption of the educational context other than the fact that people might take offense. So faculty and students who behave properly in the classroom and do not illegally harass others, should not be punished for controversial or offensive statements made on their own time. This is basically what is enforced in public universities, and the authors believe, as do I, that it should be enforced (though not legally required) at any institution of higher learning that wants to be taken seriously as such. On the question of guest speakers, the authors bring up The Bell Curve, which is a good example since it was just last year that hundreds of students at Middlebury College in Vermont shouted down Charles Murray (one of the book’s co-authors) and started violence that left a faculty member injured. The Bell Curve was published in 1994, and argued for racial differences in intelligence which account for different levels of economic and social success in America. Then as now, it was tempting to prevent the idea from being aired on a college platform, but rather than being worse off for it, society was better off since the book was subjected to rigorous scholarship and refuted on that professional basis. Angry students don’t have veto power, in any case, over students who want to hear the speaker. 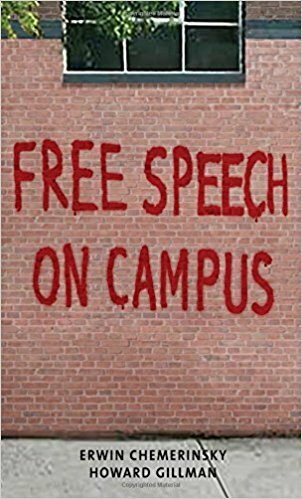 The authors give a short history of colleges and universities in America, and their long road to intellectual freedom, culminating in the Berkeley Free Speech Movement of 1964-65, and a good discussion of the “six-year war” fought long and hard over free speech rights on campus. How Berkeley has dramatically changed since then, with its students protesting Bill Maher as the 2014 commencement speaker for his supposed “hate speech”. Which is the subject of the next chapter.